Following GRE Test Prep Tips was shared by Anju. 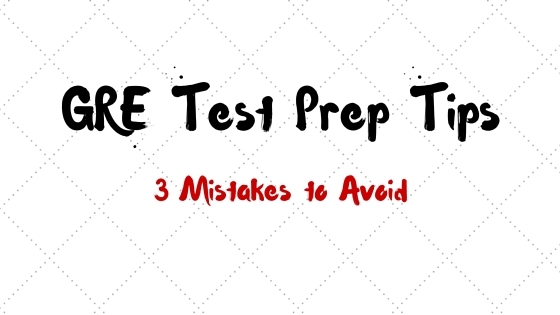 He shared his customized GRE Test Prep Tips and three GRE mistakes other test takers should avoid. To start off this post, I’d first like to give a bit of a background on why I wanted to take this GRE Test. As is probably known very well, GRE scores can be used for a host of Masters program across the board. A lesser known details is that quite a few B-Schools accept GRE scores too. With my eyes on doing an MBA, I took the GRE as it helps to keep my options open. As I’m looking for a course on Non-Profit Management, it helps to have access to some excellent non-MBA programs too. I gave my GRE on the 16th of June in the US. I was initially scheduled to appear for the exam on the 2nd of June. But as luck would have it the center faced technical issues on this very day, and I had to reschedule my exam. While preparing, I was more worried about my Verbal section than the Quantitative section. As I’ve done an Engineering and given a GMAT in the past, I didn’t expect the Quantitative section to be a hard nut to crack. Ah well, what can I say! On the day of the test, I reached the center a good 40 minutes before my test. After the Analytical Writing section, I have had two Quantitative and three Verbal sections. I realize there are tons of blogs that tell you how to study for each section in the test. Here is how I went about studying for GRE test. I did Nova’s Math Prep for three weeks. I did all the practice questions in this book. My GRE experience convinced me that the level of Math was exactly the same and in a very few questions it even qualified as “Hard” questions in the book. For the Verbal Reading Comprehension section, I used Barrons GRE and the Official ETS GRE Guide. I did make attempts to go through the Barron’s word list. But frankly just doing word lists was a pretty overwhelming task by itself. And in my experience learning words by rote without knowing the context can be a painful exercise. So, I devised my way to learn words that worked for me. First I figured I didn’t need to learn all words in the list as most of it were ones I knew. So, I filtered out the ones that were new or had a meaning I didn’t quite know. Then, I went on to classify words by the parts of speech. I maintained an excel file that categorized words in this manner. I also started grouping words that were synonyms OR could be used in a similar context. For, e.g., Baleful and Minatory. Both are adjectives that can mean threatening. So, in this way I could remember words by association and could always substitute one GRE word with another. As advised by most GRE tutors, I did a lot of reading online. Newyorker, Atlantic Monthly, and the Hindu to cite a few sites. I almost always found words that were on my watchlist on the excel sheet. I looked up these words and the entire group. I found tons of helpful tips and material from the Magoosh GRE. I did diagnostic tests from all GRE prep sites and the ETS software. Should Have Timed Your Tests: My Quantitative scores are on the lower side for the college I’ve in mind. The main reason is that spent about six crucial minutes on one question in the test, and then I did my biggest mistake that I’m never known to do. I panicked. All this could have been averted if I had spent a couple of minutes on this question and moved on. Something I should have done even when I did the practice tests. Should have Read AWA prompts: My analytical question sounded pretty abstract to me. I came back home and read it up on the pool. It was a question of heroes in today’s society. And *THEN* I noticed a ‘Claim’ and a ‘Reason’. I’m still unsure if there was a ‘Reason’ in my AWA question. But there had to be because there is one on the AWA pool. I realized I’ll be scoring abysmally and will pay dearly because I didn’t read the ‘Reason’ prompt. My essay is an evaluation of the claim and is definitely in a different direction now that the ‘Reason’ has come into the picture. Should have Researched the Universities: I’ve a fairly good idea of which schools I want to apply. But on the test I was unable to find some of it by searching using the name field. In hindsight, I should have looked it up on the site to see which ones are on it. As it lets one choose four colleges, I hope I did not end up wasting an additional $20 for each additional school I’ll have to add later. So, it is what it is. And I do not intend to take the test again. I realize I should have allocated adequate time to prepare for the test. Not Verbal or Quantitative section. But the techniques. Related: Can I use Old GRE Books for Practice? It should have been done in conjunction with taking the practice tests and should have been a more involved process. Anyhow, I did get a lot of help from experiences posted on this blog, and I figured I should put my mistakes and GRE Test Prep tips in the public eye to help fellow test, takers. So, I hope this set of GRE Test prep tips helps a couple of you out there. I’d be glad to respond if anyone has any questions. Do you have Tips to share in addition to Anuj’s tips listed above? can you tell me which are the universities in usa and germany whch provide all these courses????? Can u please upload ur excel file in some site and then paste the link here ?! I got 283 on my GRE, I’m bewildered whether to retake the test or just wait for the admission decision of the two schools I applied to. Kapi, I’m not really sure how I can upload the file here. And, I cannot give out my e-mail ID as it’s against the ‘Comments Policy’. 🙂 Catch-22! If you can figure out how you can get your e-mail ID out to me, I’d be more than happy to mail you the file. Keep in mind though that these are words are the ones I needed help remembering and you may have a completely different list of words for yourself! or anju u can up lode file on Google docs or any shearing web site. Please share the excel sheet.It would be immensely helpful.